Lesson 3 (previous post) had seen my Head of Department sit in with a year 7 group to look at ideas he could apply. His key observation- the need for a grounding in the terminology and symbols – see first lesson which has been shared as a flipchart with the department. We move on apace to lesson 4 where pupils start to be involved in setting their own marking criteria linked to SOLO. Still no hexagons, a key aspect in the sequence of lesson’s now being blogged about by Paul Berry (see previous post). Linking activities between lessons has become very overt in this sequence of lessons. Our starter was a return to annotate the pics from last lesson. Most recall was at a uni-structural stage and some discussion ensued – see Year 7 example below. The focus today was to be on marking information onto maps accurately. We have decided as a department to return to more traditional mapping skills as many of our pupils have a lack of sense of place. So we returned to the textbook (Foundations) and a copy of the main map was shared with the class. It limits the amount of information, and hopefully this will develop a stronger use of maps in future work. Before starting though we needed to determine a SOLO based marking criteria which allowed peer marking. The pupils in year 7 in particular had clear ideas already about this. We identified how they would mark and initial and day the marking as “Sir”does so it was clear who the peer marker was. The map task was time limited. I use a variety of flash based timers which I found online- the novelty value of how the timer will end can be a distraction at the end of a task but does promote pupil interest. I circulated the room giving prompts on how seas could include other terms e.g. Channel and ocean. The work rate was very encouraging. The peer marking was successful and invoked quite a lot of table based discussions. We started to identify the idea of feed forward feedback to allow improvement of future pieces of work. Lesson 4 with years 8 and 9 included a return to the SOLO symbols image sheet and sharing recall. Also a key facts based table quiz was used to promote teamwork and remind how we already know a range of facts. These quizzes provided a good opportunity to use the interactive nature of the board to match answers to locations. Writing to compare features in different locations became the focus for Years 8 and 9. We recapped the use of directions in Relational answers. Headings were provided and I circulated to support and/ or prompt as required. Now I need to identify opportunities to use HOT maps as recommended by others including Lucie Golton, John Sayers et al. from Twitter’s growing #SOLO community. Also the mighty hexagons and linking facts need to enter the arena. Please if commenting, which image size works better – as lesson 3 or lesson 4? This series of blog posts about my use of SOLO has provoked questions from others, see comments linked to lesson 3. Posts to check – a similar follow my development approach is seen in Paul Berry’s blog. It will be interesting to match ideas, resources as both of us progress with our classes. I am pleased to have had my work with Year 7 classes accepted as a performance management foci for this year and I am keen to bring more colleagues into the classroom to experience the SOLO approach. I have also been given leave to initiate an action research based pedagogy group to investigate the teaching strategies mentioned online especially and look at trialling aspects in school so that whole school recommendations can be formulated. This is an exciting time for me professionally. Primary colleagues – there are lots of examples of SOLO in the primary school from New Zealand – are there UK practitioners (or others globally) following this development? I can see this community growing to reach wider phases of the education community. OK, so our third lesson is going to link to the department’s textbooks as a resource but encourage the pupils to engage with the images and develop their use of key language. A starter activity with the lesson’s keywords displayed on arrival. Groups’ approach to this varied, some depended on strong individuals, some discussed and shared and some didn’t look! The class were asked to volunteer to define a term and name an example. Based on their answers additional facts were discussed including types of water – fresh and salt; relative %s of water on Earth; states of elements inc. solid and liquid; and many more- this activity in several classes was extended because of the info shared. Many words were common to all three year groups with additional words linked to Tectonics for Kenya and Japan. The terms are crossed off as this was done to indicate what we had covered. The lesson instructions linked back to the starter and how they would be expected to use those terms. The move to a national scale focus was emphasised. Classes were issued an image with SOLO symbols to identify features. The textbooks and text read by the class acted as a additional source of information and exemplars of Uni- and multi-structural labelling were identified. Links were made to how we had moved our answers to Relational in the previous lesson Pupil confidence with the terms was encouraging. This activity had been encouraged by a blog post by Keven Bartle (@kevbartle) who had used an image with SOLO symbols with an A level Sociology group. As the image shows discussion in pairs and groups was encouraged before annotating the diagram, this had varying levels of success and group discussion is an area to develop further as a skill. A rough pupil survey was used to look at the number of Uni and multi structural labels and pupils self evaluated which stage their work was at, the survey showed in two year 7 classes that a second image was labelled more effectively after feedback on the first. Even where there was more low level chat progress was made but not as well as the more focused class. The use of discussion was successful, but as noted is a skill to develop further. Demonstrating progress provides a good prompt for talking with the group. I was able to feedback to the groups how their lessons were being blogged and other teachers from around the world were feeding back on their progress as well as mine as a SOLO practitioner. Teachmeets – who hasn’t heard of them? I expect that most blog readers are amongst the educators that have heard of or attended or presented at Teachmeets. I maybe wrong – please comment. An informal gathering for those that seek their own CPD often and are connected with other educators. 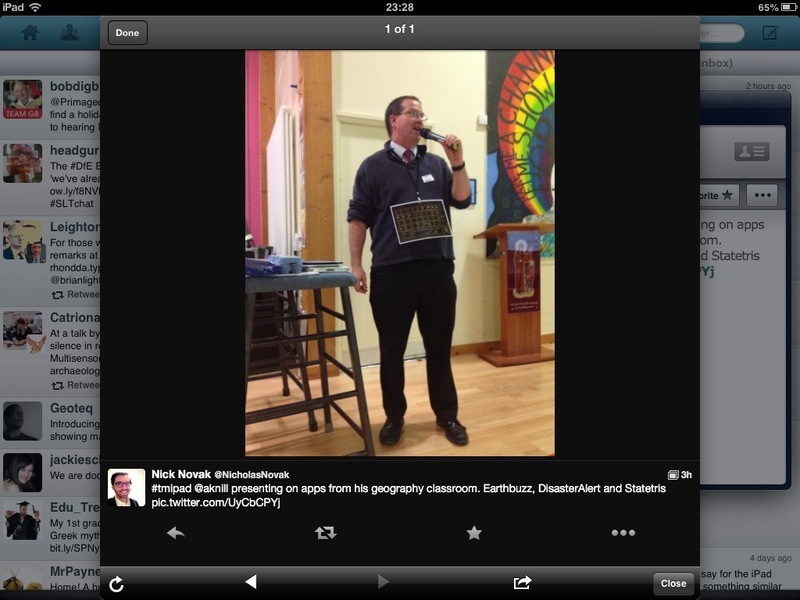 This week I had an opportunity to present at Teachmeetipad (#tmipad or #teachmeetipad). It was organised by Anthony Evans of St Aidan’s Primary, Seven Kings, Ilford. He had run the first TM I attended 4 years ago when I sat in awe of the ideas and presenters. #Tmipad was great as about 70 educators working across education from Reception to HE shared ideas with commercial organisations / sponsors ( not usually a TM feature). The iPad focus meant that many app ideas were shared but also how technology linked to lessons under Ofsted and the importance of pre-planning before purchasing equipment. On a personal note it was great to meet people whose work online I’d read or followed their exploits on Twitter. There was also a tie-in with TMBrum organised by Daniel Harvey on the same evening, timing at both ends meant this did not come off – to my knowledge. However, two presentations of mine with speaker notes provided we represented inBirmingham while I sat in the hall in Ilford. Nick Novak took a great pic as I was speaking which became my new profile picture onTwitter (see below)the badge links to my posts about Digital Leaders. Why the advert for Teachmeet Essex at the start of the post? Therein lies another post – getting involved in Teachmeet organisation. ( to post soon). Thanks to all those, especially on Twitter,who have given me feedback,retweeted or favourited the first post about this new terms’s work using SOLO. So the idea has been introduced to the classes. Our second lesson looks at the location of the unit’s country (7: UK/8:Kenya/9: Japan). An opportunity to bring in another interest and idea that two of us are experimenting with – a teacher iPad used as a secondary teaching source with apps. Myself and the Head of Department both own an iPad2, and we are developing the use of apps as another teaching source. In my room I have a digital switch box (self funded), to enable quick switches from PC or iPad sources. The starter activity includes a recap of the SOLO taxonomy symbols from the last lesson, what evidence is required in terms of facts and written style – list,sentences, paragraphs. Where pupils had been absent from the introductory lesson it allowed them to see what we were talking about as well. The learning objectives – to be able to describe location at a range of scales and to use a range of maps. With the year 7 classes earlier in the week this started from a world map with country outlines on the IWB. We looked at three words: continent, Ocean and country -which is the odd one out?discussion led to ordering the terms and identifying the term seas to match ocean as country does with continent. Then a discussion on the 8 main compass directions. I made links between these key words and how the compass directions could help to make our descriptions more detailed. Using the Key Geography text series we looked at the location on different scale maps. A text box with symbols for Uni-structural, multi-structural and relational were provided on the IWB to demonstrate how a more detailed answer could be constructed. Pupils volunteered facts we had discussed from the maps and these were recorded on the IWB. When the class were confident a SOLO stage had been attained we reviewed the evidence and discussed why the evidence was sufficient. Gradually a relational paragraph was recorded and keywords underlined to emphasise the need for geographical terms. Pupils recorded this as a model answer of a global scale location in their exercise books. The photo shows one of the Year 7 examples. A second map was used to describe the location at a continental scale or national scale. pupils developed their own description starting from Uni-structural. On checking several students answers the need for accurate literacy skills were re-emphasised especially for Capital letters for names. In most of the Year 8 and 9 lessons, which happened after my presentation at Teachmeeetipad apps used included Globe and Statetetris. Globe is not reliant on the interment and allows a virtual globe to be spun, zoom in or out so countries,continents and oceans could be discussed in combination with compass directions and location cold start with the UK and its relative size could be compared. Statetris was used with one class looking at Japan to demonstrate the game and complexity of the regions. Pupil responses varied. Using the SOLO symbols provided a framework but more confidence is needed to extend written answers. I feel a need for hexagons and maybe even dominoes coming up. What did you learn at school today, Dad? Yes, I get to ask the what did you do? question of my 14 year old but usually I’m asked about my day too. Do I really share all my developments about SOLO etc? No but he’s aware of my Teachmeet presentations and has watched them on YouTube several times and can feedback about them – not an outcome I ever expected. So, what have I been doing since the museum trip before half term? It would be fair to say that life and learning has been busy. I will post about each separately as they appeal to different groups of people. SOLO, Teachmeet presenting, preparing for, tweeting, iPad apps, meeting more people, offering to be involved, training with digital leaders and teaching staff.